From goodreads: Kate Armour and Evan Maxwell fell hard and fast for each other while attending college. Their once passionate and loving relationship ended when old scars eventually tore them apart. Two years after their breakup, they’re each struggling to piece together what went wrong in an attempt to move forward. 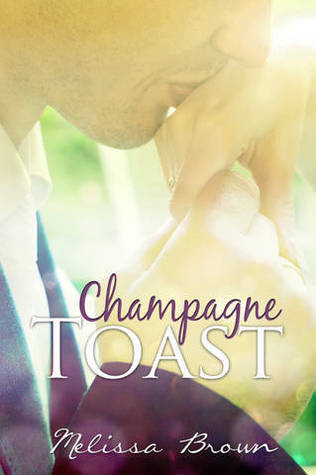 If I enjoyed Bouquet Toss by Melissa Brown then I thoroughly loved reading Champagne Toast. This is a romantic story about Evan (who was introduced to us in Bouquet Toss) and Kate and their journey in finding each other again. As much as I enjoyed it, I did think at times the dialogue was a bit forced because it didn’t ring true to a natural conversation and there were moments when the flow of the story was a bit choppy. But make no mistake, I did enjoy this book a lot. The past and present are weaved together and you are hooked from the very beginning giving us a glimpse how it all started. As the story progresses we begin to understand the circumstances in which Kate and Evan met. Ultimately that creates an unstable foundation for a new relationship, both making mistakes and hurting one another. I was definitely more invested in Kate and Evan’s story as it was more complex and painful. Kate is a gal who is strong but stubborn but without much belief in herself, until Evan. Evan inspires her, pushes her and makes her whole. I know, SWOON!!! Kate has the same effect on Evan as he wants to become a better man for her and only her. Even though we can see that they are good together, the misunderstandings begin and so does the push and pull. The missed opportunities are felt and you can’t help but want to speed read because you want to know that they’ll make it as a couple. So hold on tight because it’s gonna be a bumpy ride but so worth it! This is a story about second chances and it will make you believe in true love! My final two cents: I thoroughly enjoyed Kate and Evan’s story…I didn’t want it to end! Melissa Brown is a hopeless romantic living in the Chicagoland area with her husband and their two children. Aside from writing, she enjoys reading and baking. She also has a slight obsession with actor Henry Cavill and the TV show New Girl. Winner will be announced on January 25th via facebook! Good luck! Thanks Cristina for the review! I enjoyed Bouquet Toss and I would really love to read Champagne Toast! Congrats Melissa on the release and all the best! You are welcome…it’s such a sweet read!